Monday was my fortnightly weigh in. I've lost 1.2kg (2lb 10oz). I'm now 101.1kg (15st 12lb 14oz). I've hit one of my targets too as I'm now under 16st. It feels so good that my weight now starts with a 15! I did quite a bit of cycling last, week even though I wasn't at work all week like normal. The longest ride was on Saturday, with a total of 55 miles. It was a Livestrong awareness ride. I also went proper mountain biking in Bedgebury Forest again on Sunday. 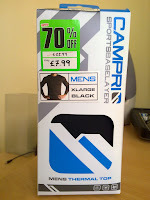 I managed to buy some clothes last week including some cycling specific items. Both of which only had one X in the size on the label! I can't tell you enough how much this boosts your confidence. Another upside is I saw myself in the mirror wearing it and didn't think I looked too bad either (because we all hate what we look like, right?). The bike related items I got were a cycling jersey and a thermal base layer. The thermal base layer was from SportsDirect.com and was only £7.99. A bargain. I've only worn it once and it really was too warm. I guess I need to wait for it to get colder! I've also taken a new profile pic as people kept saying I don't look like my old picture any more. One last thing - I'm a changed man. I don't seem to crave food any more. Since I started cycling I've found controlling what I eat the easy part. I find it easy to walk into a shop and not buy bad things. I find it easy to say no. I find it easy to consume less calories than before but yet do lots more exercise. I still get hungry at the normal times of the day but only occasionally. My brain has changed the way it handles the need for food. The upside (or downside) is I feel guilty about enjoying myself when food is involved. Most of the time if there is too much food on my plate I can stop myself from eating it all. I no longer binge on food or eat outside of meal times. Why has it taken me so long to do this? Is it because of my preoccupation with cycling? You mean you are in control of your eating? This is my first day of attempting to drop the calories, I've had my dinner and I'm starving, my stomach's rumbling and I'm struggling. I really hope things will get easier. Well done for your achievements to date. Well done indeed! The tough bit may be maintaining the miles over the cold winter months, but if a little thing like weather doesn't bother you, you will be fine! I nearly drowned last Sunday it was so wet! Tobes, you're winning, absolutely winning, I'm in awe of your food control. welshcyclist - I am definitely in control of my eating. The only time I'd say I ever feel hungry is mid-morning. If I have a packed lunch with me at work then I just have something out of there. If not then I have to go without. Purple Sue - You're right about the winter. I've not yet cycled through the winter so this will be a test. I definitely need to buy a decent waterproof jacket and trousers but I struggle to find things that fit properly still and I am such an indecisive person that I walk out of shops without buying stuff. Clive - Cheers mate. This isn't what you want to hear but I'm actually finding the food control easy. Hopefully, not long and you'll be at one with it too. Hi Toby I have followed your blog since you started. I started the same road as you back at the 1st January. My initial weight was 16st 2lb, i am now floating withing a couple of pounds of 12st. This has been done by cycling an average of 70-80miles per week , commuting and MTBing and the drudgery of eating healthily. I think I have plateaued now which i am comfortable with. I can really empathise when it comes to how you feel about food. If i go even slightly off the rails I feel guilty, which is totally stupid I know, I'm just scared its the start of the bad old ways. I'm not sure the feeling will ever go away unless I loose the desk job and start digging holes to burn the calories regularly! Keep the weight loss up your looking good! Chris - Cheers for your kind comments. You're another example that proves it can be done. The guilt is a strange one to me but it keeps me on the straight and narrow.